This year’s UK Jewish Film Festival runs from November 1st to 18th, and will show more than 50 feature films, documentaries, short films, and TV specials from all over the world at venues across London. In a first for the festival, simultaneous screenings will take place in Manchester, Leeds, Liverpool and Glasgow. Since its foundation in 1997 by UKJF Executive Director Judy Ironside, the UK Jewish Film Festival has provided an unrivalled showcase for works on Jewish themes by filmmakers from all over the world. The 2012 UKJFF will present more than 40 UK premieres from Israel, UK, France, Holland, USA, Croatia, Portugal, Austria, Sweden, Brazil and more; many have already garnered awards from festivals like Tribeca, Sundance and Cannes. 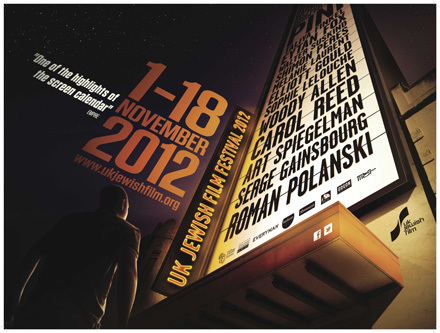 UK Jewish Film Festival from UK_JFF on Vimeo. 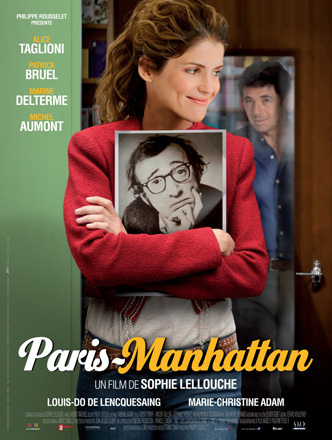 The 2012 UK Jewish Film Festival opens in style with the UK premiere of the romantic comedy Paris-Manhattan on 1st November at the BFI Southbank in London and at Manchester’s Parrs Wood Cineworld. Informed by the eternal wisdom of Woody Allen, debut writer/director Sophie Lellouche’s delightful film is about a young woman whose choices in life and love are shaped by the philosophies of her favourite filmmaker. French writer/director Sophie Lellouche’s delightful debut featuring love, relationships, family, work...and Woody Allen. Paris Manhattan - trailer from UK_JFF on Vimeo. Beirut, 1982: a young Palestinian refugee and an Israeli fighter pilot form a tentative bond in their attempt to make their way across war-torn Lebanon back to their home. Eytan Fox’s bitter/sweet follow-up to the groundbreaking Yossi & Jagger featuring another great central performance from Ohad Knoller in this tale of isolation and friendship. Lively, provocative panel discussion with David Baddiel, Norman Lebrecht and guests about the depiction of Jews in film and television in the past and present. Beautifully shot, sparsely scripted drama about the fate of a family of Bedouins facing eviction from their ‘unrecognised’ village. Completely engrossing tale of how the lives, attitudes and thoughts of four school friends change when they join the army. Poisoned - Trailer from UK_JFF on Vimeo. Riveting documentary shot by British director Richard Symons and narrated by Helena Bonham Carter, the viewer is granted unprecedented access to Israel President Shimon Peres as he discloses the challenges of being in the eye of the storm for more than four decades. Three clever, funny, sharply written episodes from the hit Israeli TV sitcom created by Sayed Kashua, the Israeli-born Palestinian journalist. The show marked a milestone on Israeli TV as the first programme to present Palestinian characters speaking in Arabic. Known as the ‘Sheinfeld of the Middle East’ by some critics! Arab Labor - Trailer from UK_JFF on Vimeo. It’s Moscow, 1986 and 14 year old Borya is struggling with his pirouettes at the Bolshoi Ballet School...until he discovers how it’s done by watching a black market video of Baryshnikov. His newly found wonderment, however, gets him into serious trouble... A delightful coming of age story with a happy ending! My Dad Is Baryshnikov - Trailer from UK_JFF on Vimeo. Spring, 1945, the Germany army collapses. As the Allied forces sweep across the Motherland, five children embark on a life changing journey. 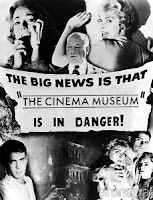 Dramatic, dark, captivating viewing. Beautiful story about 96 year old Miriam Weissenstein’s fight to save her late photographer husband’s life work and photography shop from being destroyed by property developers. Helped by her devoted grandson, Miriam’s inspiring journey is funny, touching, extraordinary. Life in Stills - Trailer from UK_JFF on Vimeo. Rousing silent film set in Manhattan’s Lower East Side at the turn of the century where traditional ways of life start to give way to integration and modern society. This special screening at the Barbican will be accompanied by live music written and performed by celebrated violinist and composer, Sophie Solomon with members of her band. Swedish director Lena Ohlin’s award-winning film version of the bestselling novel by Marianne Fredriksson is set in rural Sweden about two families, their friendship and common destiny. Simon and the Oaks - Trailer from UK_JFF on Vimeo. A fascinating closeup of the life and work of the great songwriter, composer, musician, artist and controversialist Serge Gainsbourg all told in his own words and illustrated by rarely seen footage of his performances, his friends, his influences. This intricate detective story charts the journey made by Egon Schiele’s famous painting, Portrait of Wally. Stolen by the Nazis from a private Austrian collector, the painting eventually turns up at New York’s MoMA and a legal war ensues. Illustrated comic by Pulitzer Prize winning graphic artist Art Spiegelman is turned into a film featuring music and narration. Spiegelman’s view of mankind after witnessing the horror of the September 11th terrorist attacks makes for gripping viewing. 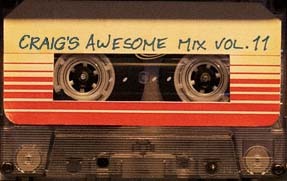 In the Shadow of No Towers - clip from UK_JFF on Vimeo. Tai is 17, Naim is 20. She’s Israeli and lives in Jerusalem. He’s Palestinian and lives in Gaza. Divided by more than just a road, they develop an online relationship and influence each other’s lives while hoping, one day, to meet. Short film written by Amy Rosenthal and starring her mother, Maureen Lipman. One of two winners of the Pears Short Film Fund who offer two grants of £10,000 for the production of a short film or video with a Jewish theme of significance and with a maximum length of ten minutes. Fascinating documentary written and directed in 1948 by author Meyer Levin follows the desperate flight of hundreds of displaced Jews throughout Europe as they try to find a new home. David, a young Muslim boy growing up in Brooklyn inadvertently befriends a group of Jewish boys; when they discover his true identity, they drop him like a hot stone. Bitter/sweet tale of the beauty of friendship and brotherhood, the cruelty of tradition and truth. David - Trailer from UK_JFF on Vimeo.